How to Cook an Egg was requested by one of my regular customers. Having been in the restaurant business for over 30 years, I was not surprised by the request. I have actually met chefs who could not cook an egg properly, let alone cook an over easy egg. This request started me thinking about my egg cooking experiences. High school home economics class was my only real experience before I was married and I guess that didn't sink in. The only thing I remember about eggs in that class was making Eggs ala Goldenrod (which I still love) and beating an egg and then measuring it in tablespoons for the purpose of making a recipe that required half an egg. I never, ever, came across another recipe requiring half an egg. So basically as a new (young) bride I had to start from scratch. I married a very finicky egg eater and after being scolded for imperfect over easy eggs, I began throwing eggs away if they weren't "just right." I must have ended up throwing away dozens of eggs while perfecting my egg cooking skills. I thought I must be a slow learner. I just had to learn how to cook an egg! Had he known, my thrifty, finicky husband would have lectured me about wasting food. But as the words of the song "Margaritaville" say, I thought it was "his own darn fault." I never did reveal my secret. Practice does make perfect, as it is said, and eventually I learned how to cook an egg. After the death of my first husband (no, not my cooking), I married another wonderful man. I was pleased that I could cook perfect over easy eggs for him. Being the thoughtful man he is, he didn't mention for some time that he really preferred HIS eggs over hard. Oh, the cruelties of life! I don't mind saying that it was very hard for me to break those yolks! 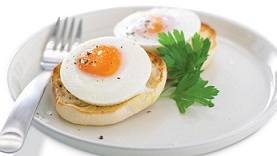 Egg dishes are nutritious, economical and usually quick to put together. They are an excellent way to add protein to a light meal whether hot or cold. Egg dishes are wonderful anytime, not just for breakfast, and you can fry eggs, scramble eggs, boil eggs, poach eggs or cook them into an omelet or frittata. My family thoroughly enjoys eggs of various kinds for any meal. For that matter, so do many of the restaurant guests. 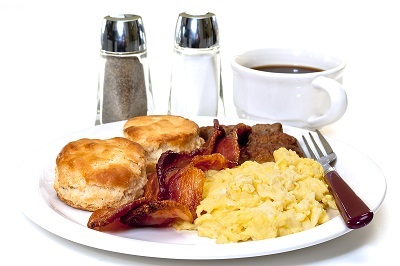 Occasionally we have an omelet or steak and eggs late in the morning and skip lunch altogether. One of our favorite late breakfasts is a Denver omelet with ham, green pepper and onion. And if I scramble these same ingredients with eggs and put that between pieces of toast it becomes a Denver sandwich, which is equally good. If I only serve a fruit smoothie for breakfast, I sometimes cook bacon and eggs for dinner with fresh baked buttermilk biscuits. These are the sort of meals everyone sometimes secretly longs for. Omelets and frittatas can be filled with any meats, seafood, vegetables or cheeses or any combination of these items making a great way to use left overs. Just add fresh fruit or a salad and some crusty bread or a blueberry muffin or bran muffin to have a fabulous meal. I always start with fresh, organic AA eggs. The taste and color difference in organic eggs is noticeably better. The three grades of eggs listed by the US Department of Agriculture (USDA) are: AA, A and B. The best grade is AA which has a firm yolk and white that can stand up high when broken onto a flat surface and does not spread over a large area. Eggs keep for weeks in the refrigerator, but lose quality quickly if held at room temperature. In fact, eggs can lose a full grade in one day at warm kitchen temperatures. Why pay for Grade AA eggs if they are grade B by the time you use them? I use high quality non-stick pans with sloping sides to cook eggs and I use these pans for nothing else (dedicated to eggs, they are). The pan should have a metal handle so it can be put under the broiler for finishing certain egg dishes. The size of the pan depends on whether you like thick or thin omelets or on how many fried or scrambled eggs you normally cook at one time. A 7 - 8 inch pan will make thicker omelets and will fry 2 - 3 eggs. A 10 inch pan will make thinner omelets and will fry 4 large eggs. I love to cook eggs in butter for superior flavor. However, butter burns easily so I use half butter and half vegetable oil. Blending in a little oil keeps the butter from burning and will give the eggs great flavor and color. It is best to have the eggs at room temperature just before cooking so take them out of the refrigerator 30 minutes before you want to begin cooking the eggs. Keep in mind that you should cook eggs on gentle heat. Stove temperatures vary, so you will have to find the correct temperature on your own unit. If the fat (oil) you use is not hot enough, the eggs will spread too much and may stick. If it is too hot, the eggs will become tough or even crisp. If the temperature is right, the eggs should set quickly at the edges. At this point, reduce the heat to low and finish cooking the eggs to your liking. Heat the pan over moderate heat. While the pan is heating, beat 2 or 3 eggs in a small (measuring bowl) (measuring tools and mixing bowls) until well-mixed. Do NOT whip until frothy, however. If you want to add a little water, now is the time to do so and then whip again. Add the oil/butter combination to the hot pan. When the butter stops foaming, whip the eggs a couple of times and pour into the pan. Let the eggs sit until they begin to cook around the edges. Then lift the edges of the eggs with a rubber spatula and tip the pan to allow the liquid to run underneath. Repeat this process until the top is thickening and very little liquid egg remains. Spoon filling (ingredients, if any) across the bottom of the omelet and add a little salt and pepper if desired. Fold in half and slide onto your plate. A frittata is a flat omelet that originated in Italy. They are made by mixing beaten eggs with a variety of ingredients such as vegetables, meats and/or cheese and then cooking the mixture over low heat without stirring. To finish, it is either flipped over or put under the broiler or into the oven until the top is set. I like to add cheese just before putting the frittata under the broiler to melt and brown the cheese a little. If desired, you can heat the additions (ingredients other than eggs) in the skillet for a minute or two before adding the eggs. To serve, simply cut the frittata into portion size wedges and plate. Again, please remember to use fresh eggs. Add about 1/8th inch of oil and butter to your pan and set over moderate heat. Add the egg(s) when the fat is hot enough that a drop of water sizzles when dropped into it. Reduce the heat to low and cook the eggs to your liking. Over Easy Eggs: Fry and flip over (see note below) and cook just until the white is set (the yolk is still liquid). Over Medium: Fry and flip over (see note below) and cook the egg(s) until the yolk is partially "set." Over Hard: Fry and flip over (see note below) and cook the egg(s) until the yolk is completely set. Some people like the yolk broken before the egg is flipped and then cooked until the yolk is firm. Note: As an alternative to flipping eggs - which takes some practice without breaking the yolks - reduce the heat to low, cover the egg pan with a lid or foil and cook until the white is set but the yolk is still liquid for over easy eggs, or partially set for over mediums. For over hard, the egg(s) should remain covered until the yolk is hard. Personally, I'd flip the egg or eggs and if the yolk(s) break - too bad - eat 'em anyway! Oh - I have changed! Start just like you were going to fry an over easy egg. As the egg begins to cook, add a few drops of water to the pan and cover it so the steam cooks the top of the egg. A thin film of egg white will cover the yolk which should remain liquid. The same effect can be achieved by spooning hot fat (such as bacon fat) over the egg as it fries but this may make the egg greasier than desired. Scrambled eggs should be soft and moist, unless you like them "scrambled hard" like someone I know (and love). Heat the butter/oil combo over low heat in a skillet. While the pan is heating, beat the eggs in a mixing bowl until well blended (but not frothy). Add 1 - 1 1/2 tablespoons of cream for every two eggs, if desired. 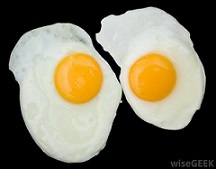 When fat is just hot enough to sizzle a drop of water, pour in the eggs. Cook over low heat, stirring occasionally as the eggs cook. Remove the eggs from the heat when they are "set" but still soft and moist. What do I frequently add to scrambled eggs? Who doesn't love Eggs Benedict? I hate to be a nag about it, but use the freshest eggs you can find. Fresh eggs maintain their shape because the yolks and whites are firm. If the eggs you are using are not (you suspect) as fresh as you'd like, add 1 teaspoon of salt and 2 teaspoons of distilled vinegar per quart of water (yes, you are cooking eggs - poaching eggs - in water). In a low pan, bring a quart of water to a simmer (NOT a boil). Simmer 3 - 5 minutes, until the whites are done and the yolks are still soft. Remove the eggs from the pan with a (slotted spoon)(cooking utensils) and drain well. Place the meat on the split English muffin, top it with the well-drained poached egg and ladle delicious (Hollandaise Sauce) over all of it. Place eggs in a sauce pan and cover with cold water. Cool just for a few seconds if eggs are to be served hot. Cool further if they are to be held for later use. For easier peeling, peel while the egg is still warm and hold under running water to help loosen the shell. There you have it. Everything you need to know about how to cook an egg. Now I'll share something with you. When I hire a breakfast cook (chef), I buy an extra case of eggs (yes, I said case) and require the individual to practice all of these cooking methods until he/she can do all of them quickly and to perfection. By then, they know how to cook an egg. Thanks for reading "How To Cook An Egg ." Enjoy your perfectly cooked eggs and the company of those you share them with!